Packetbeat lets you monitor real-time network traffic for application level protocols like HTTP and MySQL, as well as DNS and other services. To do this, you configure agents, called “shippers”, on client machines which sniff and parse network traffic and map the messages to transactions. These shippers then generate records for each action and send them to Elasticsearch or Logstash. Once you have the data, you can search, analyze, and visualize the data with Kibana so you can make informed decisions about your infrastructure or troubleshoot problems. In this tutorial, you'll configure and use Packetbeat with an ELK stack to gather and visualize infrastructure metrics. One Ubuntu 16.04 server with 4GB of RAM, configured with the ELK Stack setup described in the tutorial How To Install Elasticsearch, Logstash, and Kibana on Ubuntu 16.04. 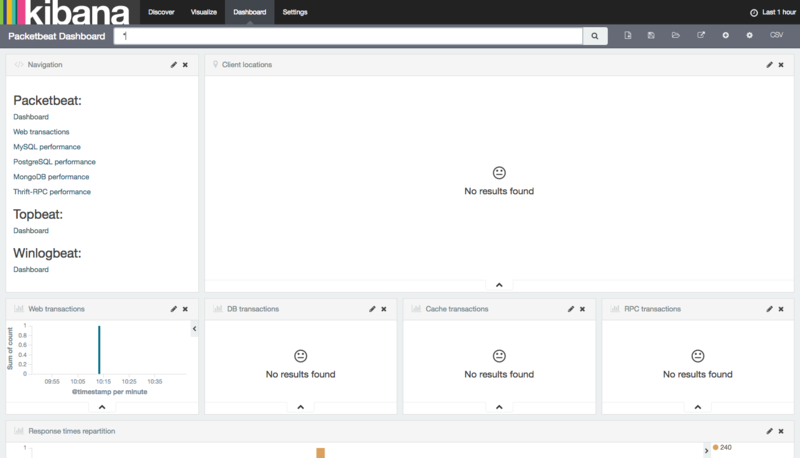 Follow the tutorial to configure the ELK stack and install the Kibana dashboards, but don't configure any client machines. One Ubuntu 16.04 server with any amount of RAM, which will serve as a client machine. A standard user account with sudo privileges for each server. You can set up a standard account by following the Initial Server Setup with Ubuntu 16.04 tutorial. Because we are planning on using Packetbeat to ship logs to Elasticsearch, we first load the Packetbeat index template, which configures Elasticsearch to analyze incoming Packetbeat fields in an intelligent way. You'll see the output if the template was loaded successfully. Now that your ELK server is ready to accept data from Packetbeat, let's set up the shipper on a client server. To set up the Packetbeat shipper, you need to get the SSL certificate that you created in the prerequisite tutorial over to the client server. It is required to establish communication between the client servers and the ELK server. After providing your password, ensure that the certificate copy was successful. If the file is blank, or this line does not exist, please add it and save the file. Then exit the editor. 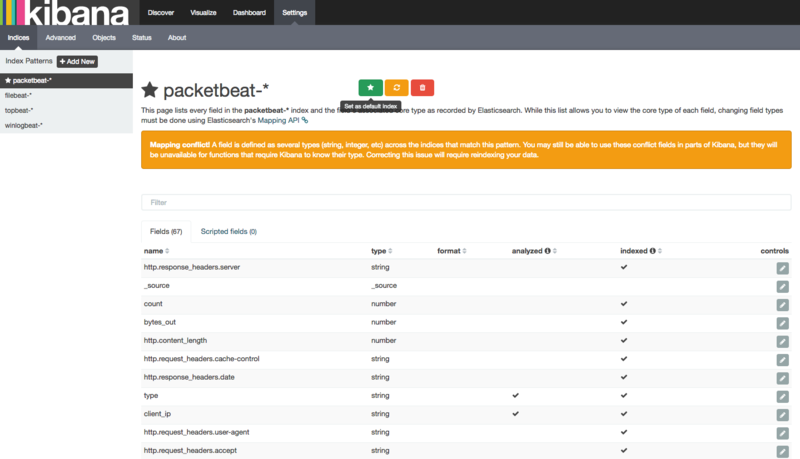 Packetbeat is now installed but needs to be configured before you can use it. Packetbeat needs to know what to log and where to send the data. Let's configure it to connect to Logstash on our ELK server and define what kind of traffic we want it to watch. We'll do that by modifying the default configuration file that comes with Packetbeat. Note: Packetbeat's configuration file is in the YAML format, which means that indentation is very important! Be sure to use the same number of spaces that are indicated in these instructions. Near the top of the file, you will see the input section, which is where you can specify which metrics and statistics should be sent to the ELK server. We'll use the default input settings, but feel free to change it to fit your needs. # Select the network interfaces to sniff the data. You can use the "any"
# keyword to sniff on all connected interfaces. In the protocols section, configure the ports on which Packetbeat can find each protocol. If you use any non-standard ports, add them here. Otherwise, the default values should do just fine. Next, we need to tell Packetbeat where to send its data. Under the output section, find the line that starts with elasticsearch:, which indicates the Elasticsearch output section. We are not going to use this section, so delete or comment out the entire Elasticsearch output section, up to the line that says #logstash:). # Array of hosts to connect to. This configures Packetbeat to connect to Logstash on your ELK server on port 5044, the port we specified for Logstash input in the prerequisite tutorial. This configures Packetbeat to use the certificate we copied from the ELK server. Without this, the client will be unable to establish a connection. Once you've reviewed your configuration, save the file and exit the text editor. Repeat this section for any other servers that you want to monitor. Packetbeat should now be listening for network traffic and sending it off to Logstash. Let's see if it's working. At this point, Packetbeat on your client server should be shipping logs of your network traffic to Logstash on your ELK server. Logstash should be loading the Packetbeat data into Elasticsearch in an date-stamped index called packetbeat-YYYY.MM.DD. Let's test that this works by creating a simple HTTP request on the client machine and looking for that request in Elasticsearch on the ELK server. On your client server, use curl to make a request to http://www.elastic.co. 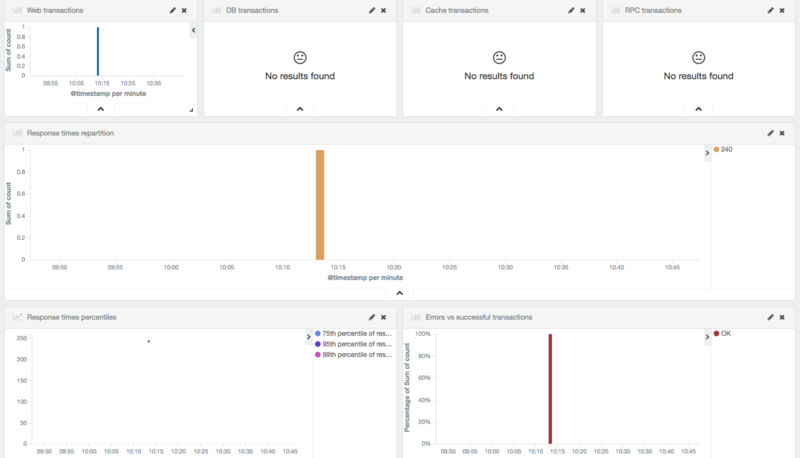 If your output shows 0 total hits, Elasticsearch is not loading any Packetbeat data under the index you searched for, and you should try again after a few seconds, as it may take a short time for the data to be picked up. If you still see no results after waiting, review your setup for errors. Ensure you have pointed Packetbeat's configuration file at the certificate you transferred over, as this will fail silently if the path is incorrect. Once you have received the expected output, you can move on to the next step and learn how to use Kibana to see some charts and graphs of your network traffic. When you are finished setting up Packetbeat on all of the servers that you want to gather system stats for, let's look at Kibana. In a web browser, go to the domain name or public IP address of your ELK server. 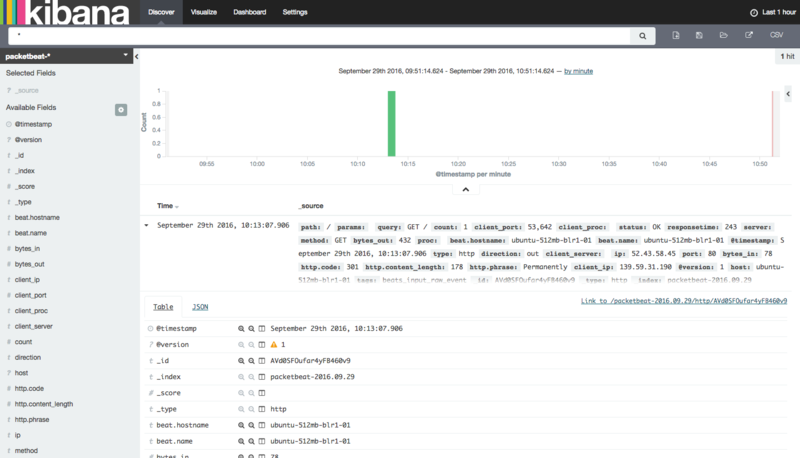 After entering your ELK server's credentials, you should see your Kibana Discover page. 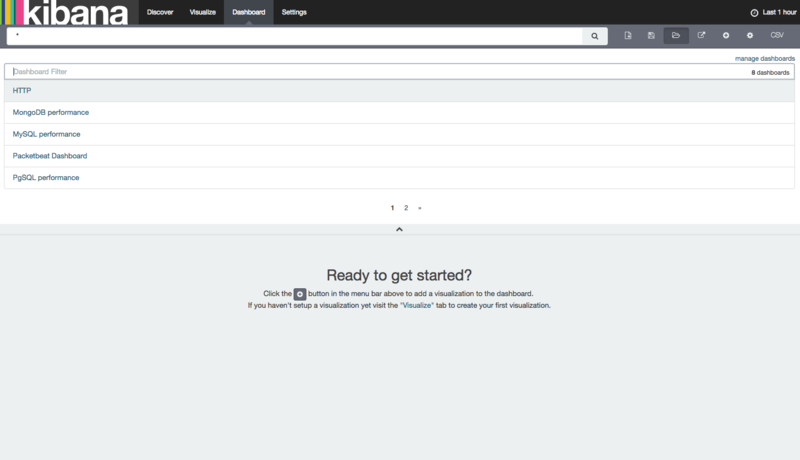 Note: You configured these credentials during the prerequisite tutorial when you configured the user for Kibana. From here you can view your various Packetbeat entries by filtering on the available fields. You can click on these fields to add them, or visualize them using aggregations (count, sum, min, max, median etc). Kibana also provides a wide range of visualizations that you can use to analyze data. 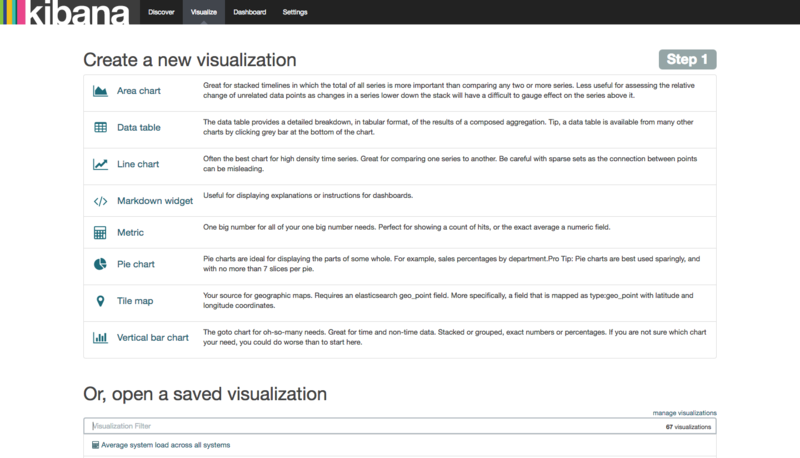 Click the Visualize tab at the top of the screen to list visualizations or open a saved visualization. Select Packetbeat-Dashboard from the list of suggestions. Since we only have a few web requests as documents in our index, the dashboard will result in No results found for DB, Cache, RPC transactions, or other results. But if you scroll down, you will see a variety of metrics that were gathered from your client servers that you installed Packetbeat on. From here you can create charts based on the index data. For example, you can create a chart that shows HTTP query breakdown based on response time, which can help track down slow responses from your web applications. And you can drill down more by using sub-aggregations to find the response time for each code, domains visited, and much more. You can explore the Packetbeat documentation to learn more. Now that your system metrics are centralized via Elasticsearch and Logstash, and you are able to visualize them with Kibana, you should be able to see what your servers are up to at a glance. From here, you may want to investigate other shippers, including Filebeat, Topbeat, and others. Look at the Beats page for more information on available shippers.